(CNN) -- Jose Maria Olazabal has agreed to be assistant to European captain Colin Montgomerie at next year's Ryder Cup in Wales, but only if he does not qualify for the side. 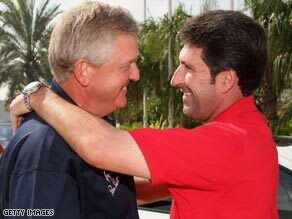 Montgomerie (left) and Olazabal have been friends and rivals since first facing each other 25 years ago. "The number one guy that I've always wanted since we first met, believe it or not, back in 1984 is Jose Maria Olazabal," Montgomerie revealed in an interview with Sky Sports News -- recalling that it was the Spaniard who beat him in the final of the British Amateur tournament 25 years ago. "I'd like him to be part of the team. He has come to me -- and I appreciate that -- and said he wants to try to be playing. But if not he has accepted and I have taken it on board that he will be part of the back team." Olazabal was vice-captain to Nick Faldo in last September's defeat in Louisville, but while he thought about whether to put his name forward for Celtic Manor, Montgomerie agreed to stand and was subsequently appointed by the European Tour's players' committee. The twice Masters champion is expected now to do the job in Chicago in 2012. "Apparently he was exceptional with Nick -- I wasn't there -- so he would be my number one choice and I have been thinking about others," Montgomerie added. "I need a good team around to me to help. This is a campaign to regain the Ryder Cup and it starts now." The next committee meeting is on the eve of the Irish Open in May and it is there that the number of European wild cards will be decided, with Montgomerie pushing for more. In recent matches, Europe have had only two, while American captain Paul Azinger was allowed four last year. "I think options in life is always a good thing," said the 45-year-old Scotsman. "When you don't have them you struggle. The 10 and two situation for the European team was working because we were winning. Now we have lost do we change the system, do we go 9-3, 8-4 like the Americans? "It will be discussed at length and set in stone. I have my own views -- options are good and I would like a little more than I have now."